The cement plant is visible from the west entrance of Port-Daniel–Gascons, Quebec: the soaring tower, the silos, and the marine terminal with its loading facilities reaching into the sea. Although located several kilometers from this seaside community, they are now part of the landscape. The topography of the site means that, from the centre of the municipality, there is no visual contact with the plant, and it is only in approaching the site that a better understanding of the scale of the industrial complex, whose construction was completed during the past few weeks, is gained. I have the privilege of running this state-of-the-art cement plant and coordinating the efforts of the employee teams that now operate it. I know this plant by heart: I saw it rise out of the ground; I walk it every day, in length, width, and height; and above all, I plan to operate it to the best of its potential. Therefore, on the pages that follow, I am proud to give you a guided tour of our new facility. "The Start of Something New: Part 1"
With high-quality cement-grade limestone reserves of several decades and the potential for constructing a deep-water terminal nearby, the Port-Daniel–Gascons site was specifically chosen to house this cement plant, which will produce, nominally, 2.3 million tpy of low and moderate alkali cement. In addition to these major advantages, there is also the proximity of a high-voltage power line, fed with renewable energy (located 1.5 km from the plant), as well as a railway line that runs directly through the site, near the cement silos. Despite the stature of the installations that now occupy the site, a trained eye quickly detects the compact and functional configuration of the various equipment, strategically installed to maximise efficiency. From the additive bins to the clinker silos, the line is traced, perfectly straight. The limestone quarry is adjacent to the plant, allowing vehicle travel times to be reduced to a minimum. The design of the plant and terminal makes it possible to reduce the number of transfer points of the material and to get very high energy efficiency for the installations. 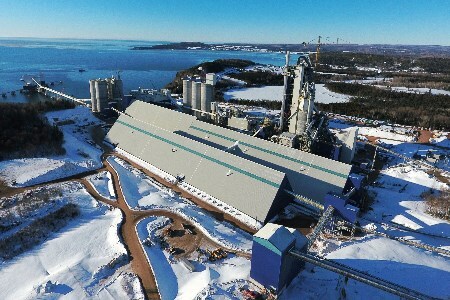 It is also thanks to the technological choices, which are less energy-intensive, that the cement plant should be among the environmental leaders of the industry, emitting less GHG per tonne of cement produced than other cement facilities in North America. McInnis chose thyssenkrupp Industrial Solutions’ (TKIS) advanced technology for its equipment. The plant is equipped with the POLCID control system and modern laboratories, ensuring the quality of the product at each stage of the process. The laboratories have been in operation since the beginning of 2016, and a team is at work, whether during the CCRL inspection or for interlaboratory tests. To support the more traditional methods of quality control, the plant relies on two online analysers to continuously evaluate the limestone from the quarry and automatically control raw meal preparation. These processes and the utilisation of this powerful technology ensure that customers will experience unmatched consistency in the final product. Technologically and ecologically, the cement plant is designed to not only meet, but exceed, the most stringent Canadian and US environmental regulations. This is an element of great pride for all members of the McInnis team, recognising that they are contributing to the development of a performance model for the industry. The onsite quarry offers an abundant supply of limestone reserves that are estimated to last many decades at an extraction rate of 3 million tpy. Quality control begins as early as the drilling stage, with precise analysis of the limestone composition, allowing planning and coordination of blasting in harmony with the needs of the cement plant. The quarry operates four days per week to feed a primary jaw crusher and a secondary cone crusher, operating at 1800 tph. A fleet of 100 t trucks discharge the limestone. The limestone is directed to an A-shaped storage hall of 270 m x 54 m, which will also house the source of silica. The limestone is stored in two piles of 30 000 t and recovered by a bridge reclaimer. When the plant reaches its full operational capacity, it will consume a pile of limestone in three days, while the second pile will be gradually replenished to take over. A supplemental limestone used as raw material and an additive limestone for the finished product are both stored separately. Two other storage halls of similar design line up next to the limestone storage hall, where it is possible to deposit the raw materials and additives to the cement in the first one, and the solid fuel in the second one. These two facilities are equipped with four portal reclaimers to recover the different materials and convey them to the stages that follow. All halls are equipped with dust collectors to maintain negative pressure and avoid errant emissions.